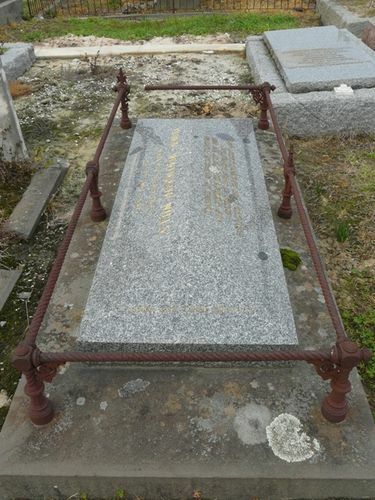 The tombstone on the grave commemorates Thomas Wills, the founder of Australian Rules football. The grave site was restored and the headstone erected over his grave by the Melbourne Cricket Club on the centenary of his death. Thomas Wentworth Wills (1835 – 1880) was a sportsman who is credited with being Australia's first cricketer of significance and a founder of Australian rules football. Wills was a survivor of the massacre by Aborigines which destroyed his family at Cullin-La-Ringo in Queensland. In 1864-5 he captained a Victorian cricket team against a visiting English team, and in 1866-7 he coached the Aboriginal cricket team which he took to England in 1868. In endeavouring to keep cricketers active during the off-season, Wills made the first public declaration of its kind in Australia: that football should be a regular and organised activity. Around this time he helped to foster football in Melbourne's schools. Wills, who became an incurable alcoholic, stabbed himself to death in 1880.